As we move into the month of June the ‘gap’ in the Nectar Flow will cause the colonies to have a stop and think what they are going to be doing over the next couple of weeks or however long the June Gap lasts. 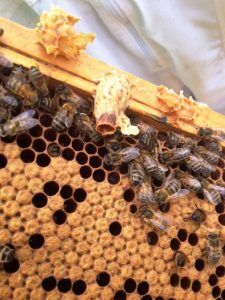 It is essential to keep checking the Brood chambers every Seven days to see if there are any signs of Queen cups with eggs or grubs turning into part formed or fully formed Queen cells. If there are follow the advice given last month and split the colony making them believe they have swarmed, and nature will take its course. But you may find the colony has realised the old Queen is failing so they build a few Supersedure cells to replace her. If you do find this just leave well alone for 3 weeks, feed syrup if necessary, then check to see if you have a new laying Queen. In the small colony, which they will probably be, it will be easy to find the skittish young Queen so mark her with a red dot as that is the Queen colour for 2018. But if you find sealed Queen cells or a Queen cell that has hatched, you can be pretty certain you’ve lost a swarm and the hatching Virgin Queens are about to fight it out until one dominates. the Queen has hatched and mated. Then go back in and mark her with your red dot. 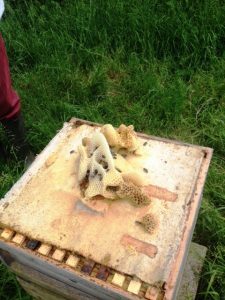 Those of you lucky enough to have strong colonies which have given you a good honey crop should be thinking, if not done already, of removing the spring crop but be wary of a dearth of nectar as the Queen will stop laying and they can go hungry. 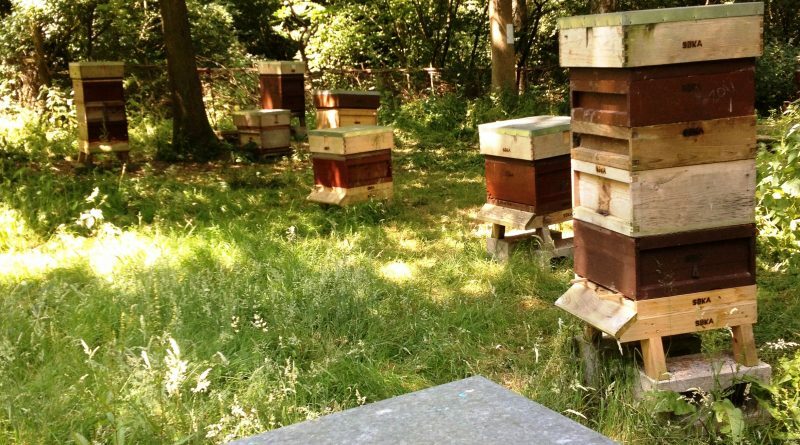 Once the supers are off it can be a good time to put a Brood chamber full of foundation above the Queen Excluder and feed the bees a couple of gallons of syrup. 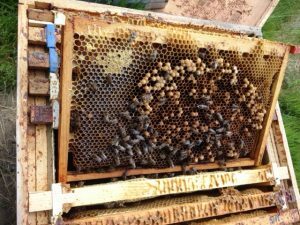 They will use the syrup to draw out the comb and store the rest in the beautiful yellow perfectly drawn combs which you can take off before you replace the supers ready for the summer flow. These new combs can be used when ‘splitting’ strong colonies to breed young Queens or just to replace those ‘orrible black or misshapen combs’ in the Brood chamber. Those of you that made the mistake of leaving an eke in the wrong place will have found the colony will fill it with wild comb. It is a nuisance to have to cut it out and re-establish supers in the right place but lesson learnt for another year. I wonder who will remember that lesson for next season? Watch out for failing Queens as I’ve had a couple of my old Queens turn Drone Layers which is easy enough to spot as there is only drone Brood and an ever decreasing number of workers. They can be difficult to requeen by this stage but a couple of combs of Brood from another hive with a good sealed Queen cell normally works. If not, get them united and the combs recycled. 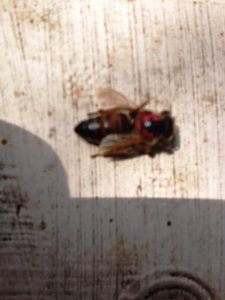 I did try boosting a tired colony that had just made it through the winter with some Brood and young bees but the new bees were not happy with the old Queen and she was ejected out of the hive onto the carpet square I keep outside their front door just for this eventuality. 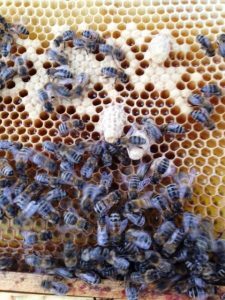 So plan B – comb fresh eggs from a nice tempered colony and they have bred a young Queen who is now laying nicely. I must get in to mark her before the colony gets too big. Last but not least the Tree Bumble Bee which I have had more calls about this year than the few and far between swarms of this season. 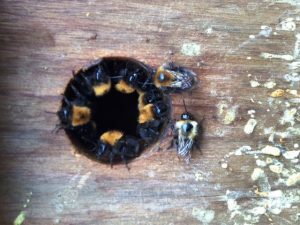 They normally take over old bird boxes and once established become aggressive and will sting you, unlike most Bumble Bees. If asked to help with the problem, veil up, best in the evening, block the entrance and relocate the entire Bird Box. They will be gone by August as the Queens hatch and disperse. 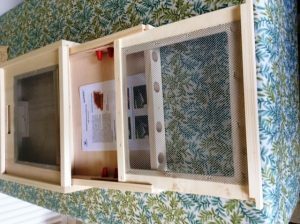 The Association Apiary has two Apishield Hornet and Wasp traps installed ready for examining at the next meeting for those of you who are preparing for any issues we may find this Autumn.